Business growth in Sussex was celebrated at the Sussex Super Growth Awards 2019, which saw Horsham based PSI-Pay Ltd take the top spot, with growth of 189.9% achieved. 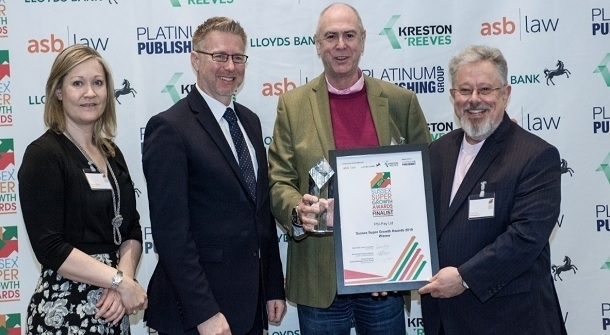 The awards, which took place 14 March 2019, sponsored by Kreston Reeves, asb law, Lloyds Bank (media partner Platinum Publishing), celebrate the fastest privately growing companies across the region. A full list of the finalists can be viewed here. Winners PSI-Pay is a technology-based payment solution for customers offering payment accounts and payment cards in many different countries and using a range of currencies. Following the appointment of a professional management team in 2014, the business went through a strategic overhaul, doubling its customer base and quadrupling turnover and profit, a trend which will continue with the introduction of innovative new products and services. Runner-up with growth of 127.1% was 1st Central from Haywards Heath, a motor insurance broker within First Central Insurance & Technology. It is a top 10 supplier on price comparison websites and has successfully built a customer base of almost half a million. The Sussex Super Growth Awards are open to privately-owned businesses trading and registered in Sussex. Growth in turnover is measured over a 4-year accounting period and a minimum turnover of £2m in a base year.